You know that failed payments is part of doing online business. Recurring subscriptions usually renew in the background, without your customer being involved. If the renewal fails for any reason, your customer won’t know, and it can end up in her account being canceled. Your customers can churn without even willing it. They might not know their account is being canceled. 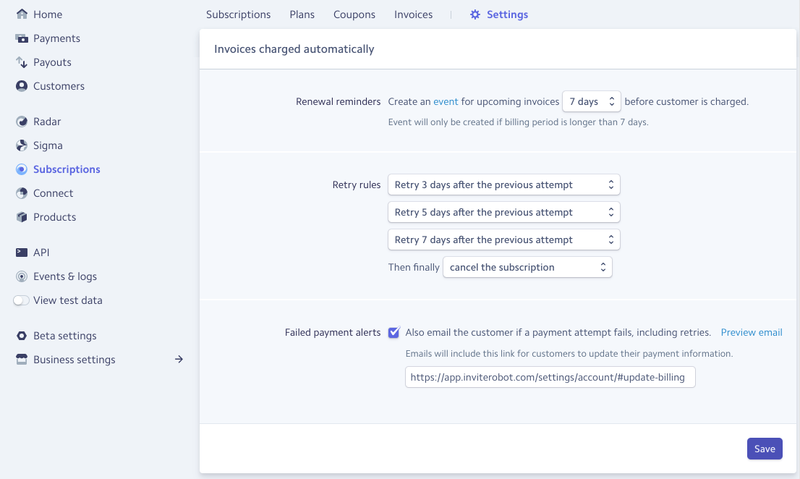 Here’s a simple and basic action you can do to recover some failed Stripe charges. Every Stripe customer should do it. The very least is to let your customers know when there’s an issue with their payment. This will give them a chance to update their credit card info. As Stripe retries to charge up to 3 times over a few days, that may be enough to resolve the payment issue. Until recently, you had no easy solution to send automatic emails on failed charges. You either had to setup webhooks, or use dedicated paid tools. Webhooks are powerful, but call for dedicated servers and custom developments. You need to write custom server code to listen to charge_failed events. Then you need some transactional email solution to deliver your alert emails. 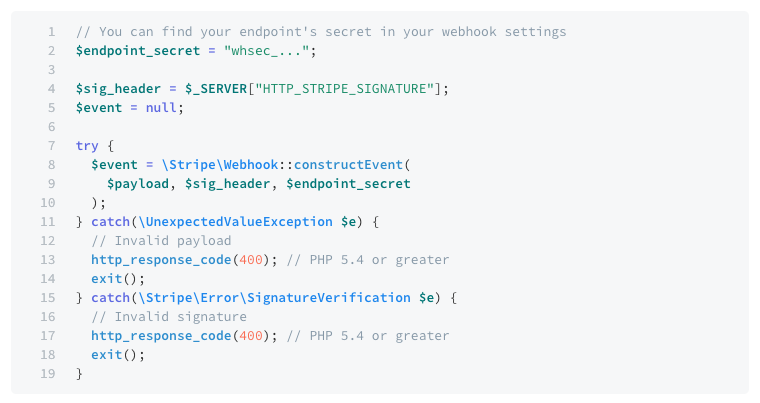 Stripe wrote a recipe on how to use webhooks to send email alerts. This is what a webhook looks like. You can also set up tools dedicated to dunning management. They’re usually the best way to reduce involuntary churn. They provide features like dunning emails, smart credit card updates, in-app alerts, etc. See Stunning, ChurnBuster, Baremetrics, or others in Stripe’s App directory. Some of the apps in Stripe's Dunning category. These are convenient tools, but also quite expensive. I’d say, perfect for established businesses who are trying to really optimize their churn. You might not be ready to shell 100’s of $ on dedicated dunning tools. At least, switch on Stripe’s built-in failed payment alerts. When you enable this option, Stripe will email the customer if a payment attempt fails — including retries. 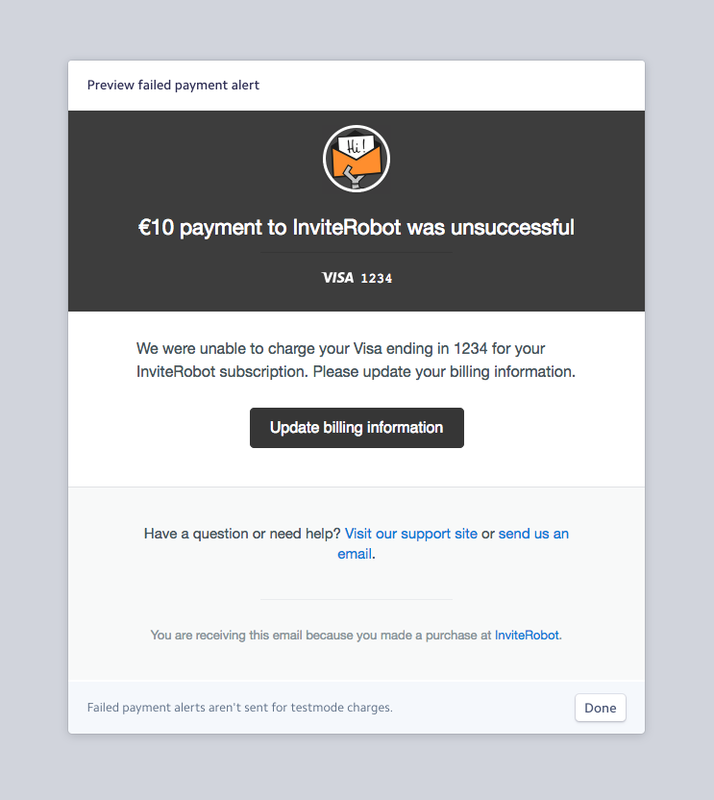 Go to your Subscriptions Settings, and check the “Failed payment alerts” option. You should customize the link to be the URL of your “update credit card” form. It’s even better if this form is accessible without a login. Less friction is better. The next best choice for the URL is your account page. This page should let your customers update their payment information. Redirect to an FAQ where you explain the situation. Why is there a failed charge, what’s at stake — account may be canceled?, and how to resolve the situation — contact you? pay in BTC? send a check? If you’ve defined a logo in your Stripe account, it will be displayed in the header of the email. A logo goes a long way to let your customers identify your business, so you should take 1 min to add it. See how to add a logo to your Stripe account. Good, your customers know… but not you! Letting your customers know is a good step. But… shouldn’t you also know when there’s a failed payment? CashNotify is the best way to get alerts for failed payments. No need to check your emails, no need to set up complicated webhooks, it just works. With 1, or 2, or all your Stripe accounts.